During an uneventful recording session at Sun Studio on the evening of July 5, 1954, [Elvis] Presley, [Scotty] Moore, and [Bill] Black were taking a break between recordings when Presley started fooling around with an up-tempo version of Arthur Crudup’s song “That’s All Right, Mama”. Black began joining in on his upright bass, and soon they were joined by Moore on guitar. Producer Sam Phillips, taken aback by this sudden upbeat atmosphere, asked the three of them to start again so he could record it. The recording session was Presley’s fifth visit to the Sun Studio. His first two visits, the summer of 1953 and January 1954, had been private recordings, followed by two more visits in the summer of 1954. 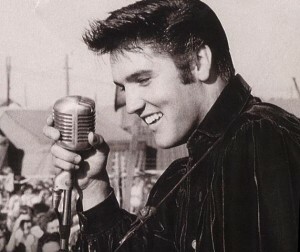 According to CMT.com Elvis Presley released more than 80 singles which made Billboard’s country singles chart. Though his first several singles for Sun Records were very popular regionally, only one charted nationally, I Don’t Care if the Sun Don’t Shine (#74 on the Billboard pop chart). The first one to hit the country chart was Baby, Let’s Play House. I Forgot to Remember to Forget (Stan Kesler & Charlie Feathers) Recorded July 11, 1955. This song was Presley’s first #1 country hit, topping the charts in February 1956 after it was re-released by RCA Victor in December ’55. Aside from the legendary Million Dollar Quartet session on December 4, 1956, Elvis did not record again for Sun after August ’55. Apparently months were spent in negotiations with three major labels before RCA Victor finally signed the 20 year old to a contract on November 20, 1955. 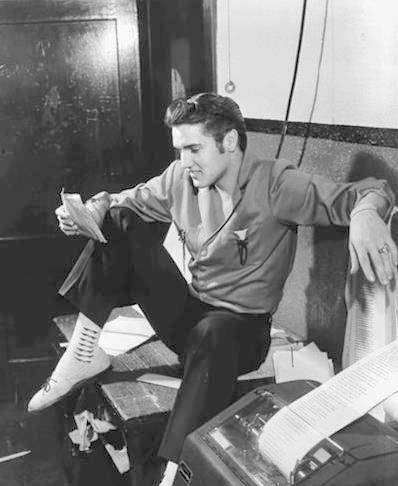 On January 10, 1956, Presley made his first recordings for RCA in Nashville. February 11, 1956 appearance on CBS-TV’s Stage Show, hosted by the Dorsey brothers. 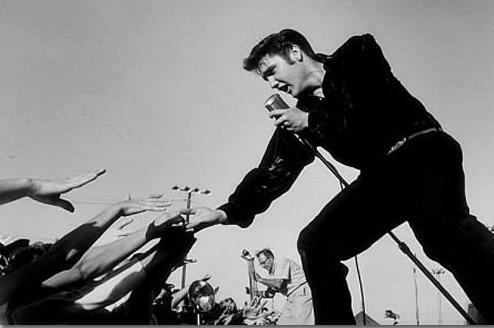 On this occasion Elvis performed Blue Suede Shoes and Heartbreak Hotel. 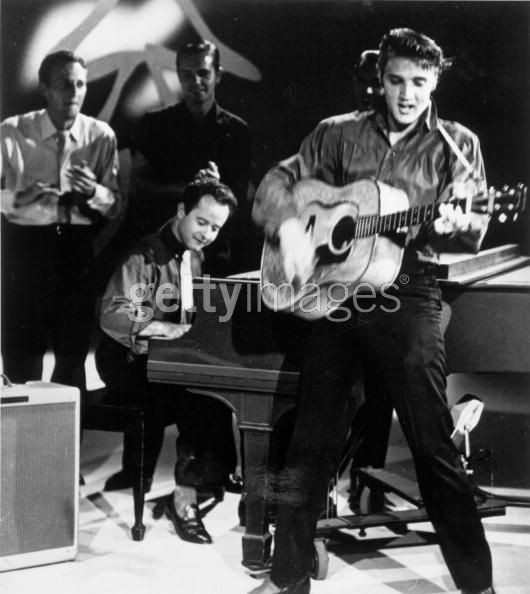 Elvis made six appearances on this program from 28 January to March 24, 1956. It was his earliest national television exposure. Elvis’s heavy touring schedule was interrupted by two appearances on the Milton Berle Show, April 3 and June 5, 1956. On April 3, 1956 the Milton Berle Show, one of the most popular programs of the Golden Age of Television was broadcast live from the deck of the USS Hancock on NBC while docked at the Naval Air Base in San Diego, California. The show starred the Esther Williams, Berle’s comedy sidekick, Arnold Stang and the Harry James Orchestra featuring Buddy Rich and featured Elvis, Scotty, Bill and DJ. Elvis Presley and band, backed by vocal group the Jordanaires, September 26, 1956. Elvis seems extraordinarily relaxed during these performances, toying with the audience and singing very loosely, often slurring words and phrases, especially in Heartbreak Hotel where he seems to feign drunkenness throughout the song. Now and then he momentarily breaks out in laughter. Sometimes he changes the original lines for comic effect, as when, near the end of I Was the One, he sings “she broke my leg” instead of “she broke my heart.” Also in I Was the One, at one point, immediately after cueing a bass part by one the Jordanaires, he puts a finger into an ear as some vocalists do at times, then decides it’s as good a time as any to clean the ear. I Was the One (Aaron Schroeder, Claude DeMetrius, Hal Blair, Bill Peppers) B-side to Heartbreak Hotel, with the Jordanaires. Long Tall Sally was a big hit for Little Richard in 1956, peaking at #6 on Billboard’s pop chart but spending 6 weeks at #1 on the R&B chart. The song was written by Robert “Bumps” Blackwell, Enotris Johnson and Richard Penniman (Little Richard). In April 1956, RCA Victor producer Steve Sholes was looking for a strong single to follow up Elvis Presley’s colossal hit “Heartbreak Hotel”. Due to Elvis’s busy touring schedule, Sholes needed to get him into the studio as soon as possible. Elvis and his band chartered a small prop plane to Nashville for one day of recording between shows. Elvis wasn’t used to working during the day. Coupled with his traumatic experience during his overnight flight, the recording session was disastrous. Take after take was ruined for one reason or another. The band was stiff. Elvis, usually a very quick study with a song, couldn’t get the lyrics right. After 17 takes, Sholes decided Elvis and the band weren’t up for recording and sent them home. After the session, Sholes listened to the takes again. He wasn’t happy with the results of what he considered to be an unprofessional and wasted session. 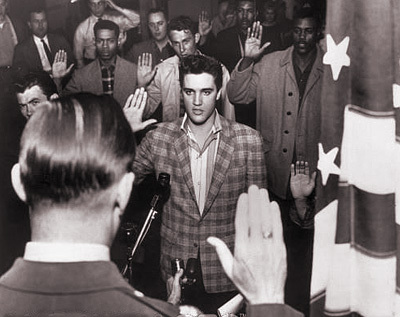 He knew that with Elvis’s busy touring schedule, it could be months before RCA Victor got him back into the studio. Sholes was determined to get something out of the session. Performing what was a very rare (and generally unsuccessful) procedure for the 1950s, Sholes took parts of two takes he liked (takes 14 and 17) and cut and spliced them together to come up with a take worthy of release. His cuts were so seamless, nobody at RCA Victor could tell it wasn’t from a single take. 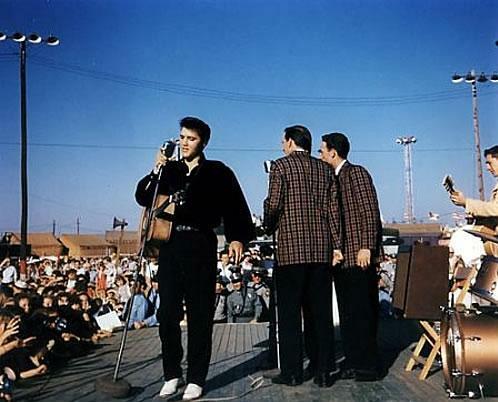 Elvis performed “I Want You, I Need You, I Love You” live on his second Milton Berle show appearance on June 5, 1956 and again when he did the Steve Allen show, July 1.
b. September 26, 1956 – Elvis returned to Tupelo, Mississippi to perform two shows at the Mississippi-Alabama Fair and Dairy Show. Elvis was born in Tupelo and lived there until he was 13 when he and his mother moved to Memphis. 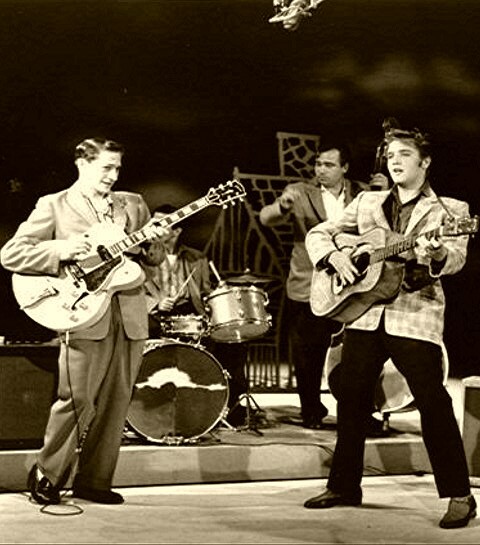 Though Elvis introduces Don’t Be Cruel by saying, “Here are the Jordanaires to help us do this song that we did on Mr. Ed Sullivan’s show back in 1932,” his first Sullivan appearance had been only 17 days earlier. 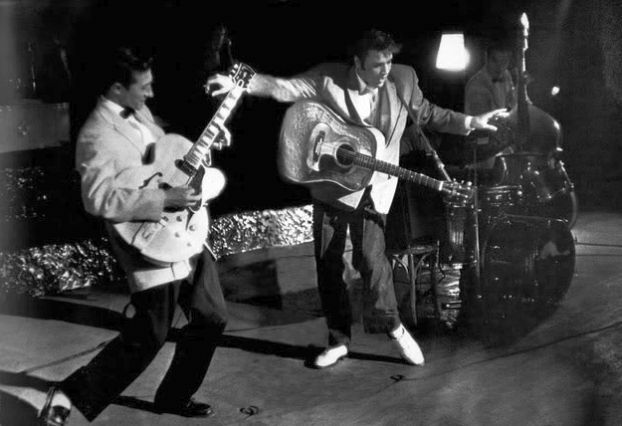 c. Elvis’s second Sullivan appearance, October 28, 1956. 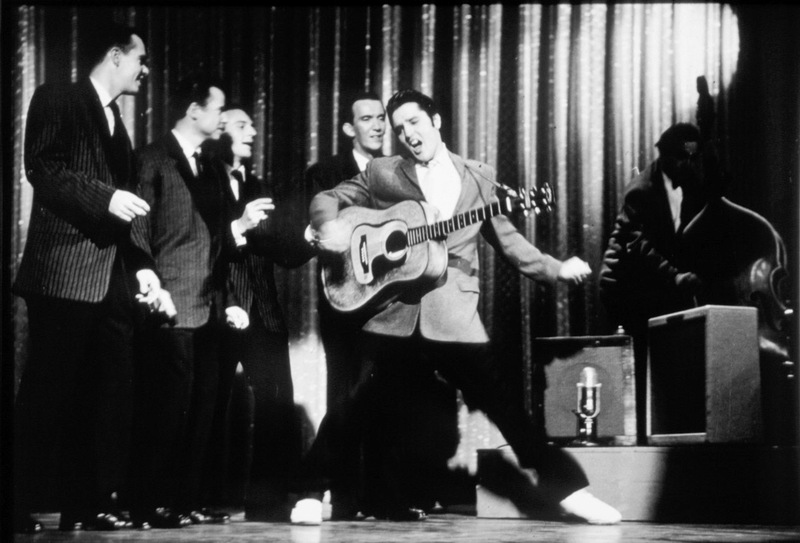 First Ed Sullivan Show appearance by Elvis, September 9, 1956. Love Me (Jerry Leiber, Mike Stoller) — recorded September 1, 1956 with vocal harmony by the Jordanaires. The first Stage Show (Dorsey Brothers) appearance — January 28, 1956. Introduced by DJ Bill Randall as a rising star who will with this evening’s performance “make television history,” Elvis performs Shake, Rattle, and Roll (Jesse Stone) and I Got a Woman (Ray Charles, Renald Richard). The song was written by Arthur “Big Boy” Crudup, and originally recorded by him in Chicago on 6 September 1946, as “That’s All Right”. It was released as a single on RCA Victor 20-2205, but was less successful than some of Crudup’s previous recordings. 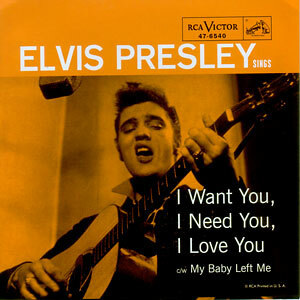 At the same session, he recorded a virtually identical tune with different lyrics, “I Don’t Know It”, which was also released as a single (RCA Victor 20-2307). In early March 1949, the song was rereleased under the title, “That’s All Right, Mama” (RCA Victor 50-0000), which was issued as RCA’s first rhythm and blues record on their new 45 rpm single format, on bright orange vinyl. 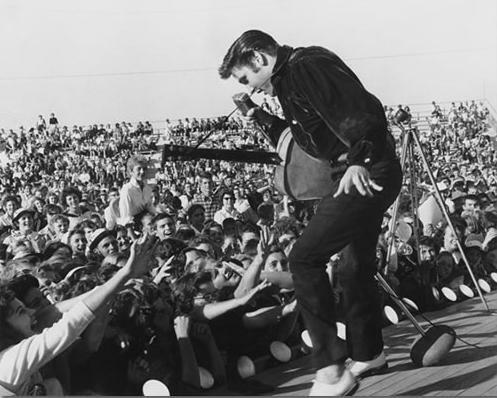 Elvis was the best… a real original, singin’ and movin’. We danced to the Dorsey Brothers and Lake Compounce in Bristol CT in ’54.